Our company was founded by our retired President, Salvatore Messina. Recently Sal passed the company down to our Second Generation of family ownership, Mr. Patsy Messina. Sal Messina instilled in all his employees a superb work ethic and a sense of pride in their accomplishments. These principals are carried out today through our new President and Owner. Lapietra Contracting Corp. is just beginning its second generation of family management and is looking forward to the future. Our founder, Salvatore Messina brought with him to America old Italian style and craftsmanship which is upheld by the current Management and our crew of skilled craftsmen. We understand that construction can be a confusing area without the knowledge. This is why we pay particular attention to having every project go smoothly from start to finish. We are not satisfied until you are. Our crews have been thoroughly trained to respect all of our customers property as if it were our own. 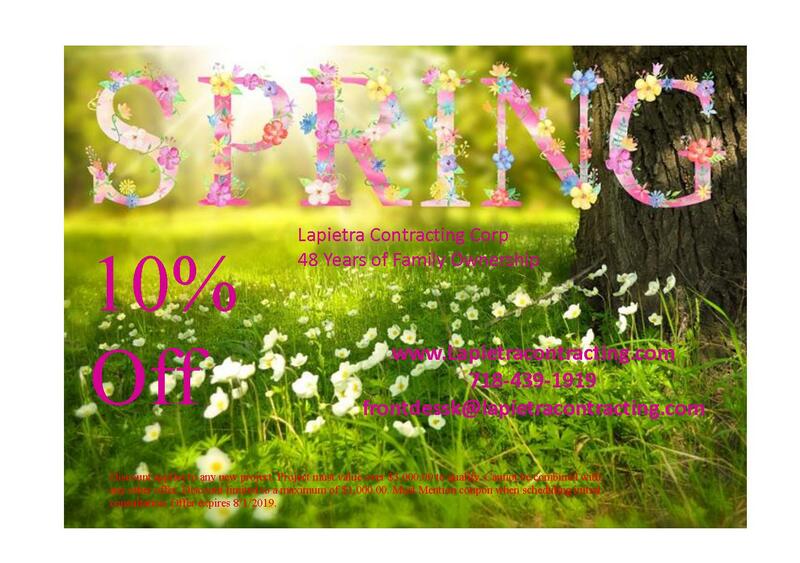 Lapietra Contracting Corp is the original "Lapietra" of Brooklyn. There have been several imitators in recent years but they do not bring the same quality and value our customers have come to expect. From bathrooms and kitchens to whole house remodels, there is no job too big or small.We place heavy emphasis on staying within your budget and completing the job on time. We can complete any concrete job from 100 sf to 30,000 sf. We specialize in working in high traffic areas of NYC. We are specialists when it comes to concrete and masonary work. Our skilled craftsmen can create whatever you can dream up.We also do structural repairs. Bulging brick wall? We can fix it!